The TU844 MTU can have up to 8 I/O channels and 2+2 process voltage connections. Each channel has two I/O connections and one ZP connection. Input signals are connected via individual shunt sticks, TY801. The shunt stick is used to choose between voltage and current input. The maximum rated voltage is 50 V and maximum rated current is 2 A per channel. The MTU distributes the two ModuleBuses, one to each I/O module and to the next MTU. It also generates the correct address to the I/O modules by shifting the outgoing position signals to the next MTU. The MTU can be mounted on a standard DIN rail. It has a mechanical latch that locks the MTU to the DIN rail. Four mechanical keys, two for each I/O module, are used to configure the MTU for different types of I/O modules. This is only a mechanical configuration and it does not affect the functionality of the MTU or the I/O module. Each key has six positions, which gives a total number of 36 different configurations. Complete installation of I/O modules using 2-wire connections and field power distribution. Up to 8 channels of field signals and process power connections. Connections to two ModuleBuses and I/O modules. Mechanical keying prevents insertion of the wrong I/O module. 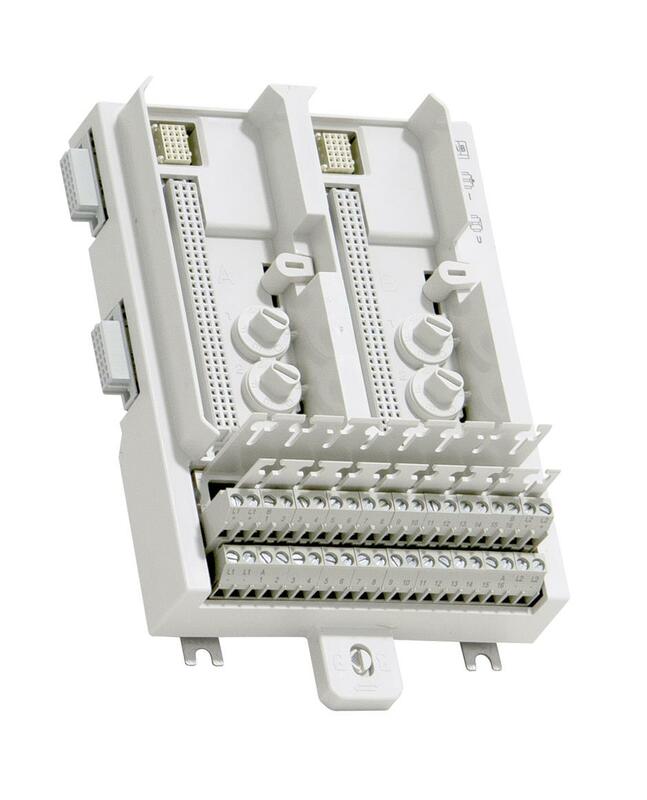 Latching device to DIN rail for grounding.